Bangkok – or as locally called, Khrung Thep, the City of Angels – was built on the banks of the meandering Chao Phraya river. Much of the land was crisscrossed by little channels – known as khlong – and houses, even all neighborhoods, were built on wooden poles. Most of the waterways in central Bangkok have been filled up, but just across the river from the Khao San road area there are still larger areas intact. The fleet of the Royal Barges is also housed here, which is open to the public. Getting around on the water, even for longer distances within the city, there are several options from cheap public boats to water taxis, and there are also organized cruises. You can get to the Royal Barges from the Khao San Road area by a little ferry. The pier is in a little lane, off the major road that runs parallel to the river. From the same pier you can board a regular ‘water bus’ to all the way to Silom Road – faster than on the road by a regular bus for the same price. 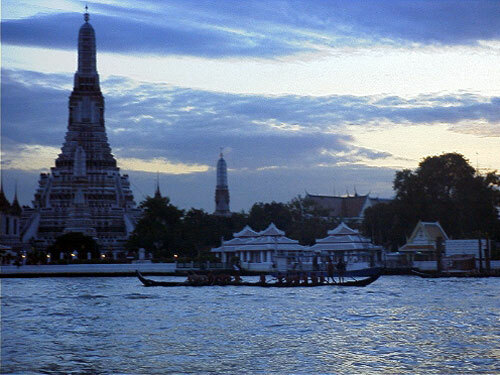 There is also a frequent little ferry between Wat Po and Wat Arun. The pier is bigger and more obvious, with several Thai restaurants and vendors around. Wat Arun, the Temple of Dawn, looks different than Wat Po and the temples around Wat Phra Kaeo, as it was built in Khmer style. Its massive stupa looks impressive from the base, and it is covered with carvings and sculptures with obvious Hindu influence. Well worth taking the ferry ride. Probably the easiest and fastest way to connect the two capitals is by the Eurostar train, which takes as little as 2 hours and 15 minutes. The biggest advantage is that you can start in the center of one city, and arrive in the center in the other one (St. Pancrass station and Gare du Nord), saving you time and money. Considering transfer times and costs, it is very competitive – and probably better – than the budget flights. You have to book as early as you can to get the best rates – tickets go on sale 90 days before trip – but you can get good prices even a few days before if you are traveling on a weekday or at certain times. 2010 is one of the snowiest winters in the UK and France, and many services were disrupted – flights as well as the Eurostar. As I am writing this post, I’ve heard news that travel is getting back to normal, which is very good news for many – especially at such an important time as Christmas. The following images were made when the first snow hit the UK and France in 2010. Located right above some of the main sights in Rome, such as the Spanish Steps and Piazza del Popolo, it offers a quiet alternative to the busy streets below. Worth even only for the view from the terraces, either you go up from the Spanish Steps or Piazza del Popolo. A short and nice walk would be to go up at one of these locations, and come down at the other. The park can be approached from the top of the Monti area as well, and you could take shorter or longer walks in the tranquil gardens. Apart from the shady trees, ponds, fountains, monuments and sculptures, there are several museums and galleries, including of course the Borghese Gallery. There is also a zoological museum and an animal friendly and educational biopark – it’s not even called a zoo to make a point. You can get around on foot, on hired pedal-powered cars, segway (electronic two-wheeler) or a little train. There are carousels, a toddlers playhouse (maybe closed in winter), kiosks and cafes so you can easily spend a whole day up in the Villa Borghese gardens – with kids of any age, or even without. View on center with the Monument to Vittorio Emanuele II. Picasso once said “I am the greatest collector of Picassos in the world” – but surely there are other keen collectors, including Mr. Pierre Le Guennec. How he got the treasure trove of 271 artwork still remains a mystery, but now in a new twist it came to light he is the heir to another Picasso collection which was due to go for sale at auction house Drouot. Now the auction has been postponed, giving those who can afford it some time to plan a trip to Paris and attend it. With so many Picassos around, maybe you can get a very good price. Anyhow, whoever the greatest collector of Picassos is, you can see a good selection at both Musée Picasso (Picasso museum in Paris) or Museu Picasso (Picasso museum in Barcelona). With Christmas only a few weeks away, everybody is thinking of some good gift ideas. Here is one great idea from the brochure of Brittany Ferries – probably aimed at British visitors, as they are used to get everything in plastic. In the supermarkets in the UK tomatoes, apples, bananas, potato etc come in beautiful plastic boxes, holding no more than 2 or 3 pieces. You find similar in other countries as well, but not to the same extent. The bottom line is, if you have a banana, you have to protect it. To know how to book train tickets within France in advance is important if you plan and organize your trip independently. It is a straight forward process. For the fast TGV trains you can use the http://www.tgv-europe.com/en/ or http://www.voyages-sncf.com websites. The first is in English, the second is the official website of the French rails (SNCF) and is in French. Using the English website give the details of your journey and select ‘Great Britain’ as ‘Ticket collection country’, then do your search. Do it this way, even if you’re not in the UK – if you write USA, for example, you’ll be redirected to a more expensive site; if you say France, you’ll be redirected to the SNCF website in French. A list with a number of possibilities will come up – they often differ in price. * After selecting the trip that suites you, you will have to ‘Choose how to collect your ticket’. Now you have the choice of printing your own ticket – the most convenient way. You can also pick up the tickets at any station in France, either using the ticket machine or personally from the office. One important point if you collect the ticket yourself: you have to have exactly the same credit card which you used online for the booking, and if there is no chip in your card (like the American cards) you have to collect your ticket from the office where they can wipe the card. Note: the TGV site is only for TGV trains while the SNCF site has all the other types of trains as well as TGV trains. Unfortunately if you want to book a train other than TGV you will have to use the SNCF website in French. *The eralier you book the better prices you might be able to get. Also there are other discounts at times – right now SNCF is giving some special rates for 1st and 2nd class trips, probably as a Christmas present. I used to travel and book hotel rooms without checking reviews and I almost never had any problems. There are good guide books I trust and I am probably not a fussy traveler anyway. However, looking up reviews recently of some hotels I know, I just couldn’t believe some of the posts – had I read those posts before I wouldn’t have stayed in the particular hotel. Maybe a personal revenge due to unrealistic expectations, a misunderstanding or bad luck, or even campaign by unethical competitors, these negative reviews can do a lot of damage to a hotel. So what can a hotel do if this happens? I just found an interesting article, titled “Top tips for hotels when responding to reviews on TripAdvisor” by Brian Payea, head of industry relations at TripAdvisor. The bottom line is, if there is a review which you think is not fair, do respond – don’t let it affect your good name. And as for customers, if you have any problems, discuss it with the hotel staff, if necessary with the manager, before you write something really bad. Most often there is a solution. Edinburgh – nature walk in the city 1. The Salisbury Crags with Arthur’s Seat is a dominant natural sight, rising above Edingurgh and visible from most part of the city. Located at the Royal Palace of Holyroodhouse and the Scottish Parliament, at end of the Royal Mile, it is easy to reach – even the Hop-On-Hop-Off buses stop at its foot. It is worth to walk at least a little up the Crags – the view of the city is stunning. There are several paths of different difficulty and shorter or longer walks can be taken. A circuit along the rocky cliffs of the Crags is 1-1.5 hours; a summit circuit to Arthur’s Seat and back 2-3 hours. See also: Edinburgh – nature walk in the city 2. If you visit Portsmouth, a nice full day program could be a walk from the port of Old Portsmouth along the coast of Southsea and taking the bus back from the end of the walk. You could even make several day programs, depending on your interests, as there are an amusement park, an aquarium, the D-Day museum, a covered swimming pool with health-fitness facilities, lively Albert Pier, a small lake with pedal-boats and swans found along the way, and of course the beach. Although the beach is not fine sand but rather gravely, it is still a popular seaside destination for locals and visitors in the summer months. There are many hotels, B&B, restaurants and pubs all along the coast and in the center. It doesn’t snow much in Paris, and if it snows, it doesn’t remain long. Although I had been to Paris a few winters before, never saw the city in white. Just recently on a forum talking about the chances to witness snow in Paris, I said hopefully this time I can see it, fingers crossed. Since I made it on time to St. Pancras railway station and my Eurostar train wasn’t canceled either, I managed to make it back to Paris again – and there it was; snow as I wished for. Not as much as there were in previous winters I heard, but in life you have to be grateful for what you get. Here are a few glimpses of this event. Eiffel Tower from Pont Alexandre III. I am a bit skeptical about the accuracy of longer forecasts, but I even forget what they said a day or two before, so I cannot be sure. Anyway, it is good to have a rough idea as what to expect.